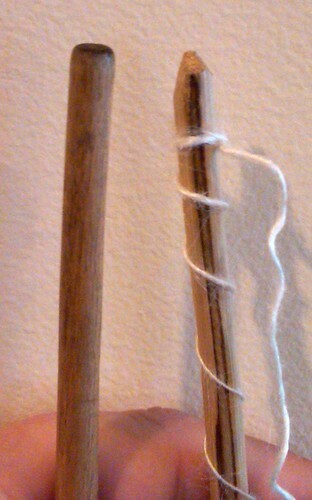 I was recently asked about Peruvian low whorl spindles and where to find them. I both love and hate this question because it’s full of simple answers… and not so simple ones. The easy answer is: you get ’em in the markets in Peru. Not the tourist markets, but the ones where regular people, generally country people and not city people, shop. Usually, the folks selling wooden spoons and turned wooden bowls and things like that will have them, if they’re carrying country-people stuff. They’re just another utensil. You could say it’s the equivalent of going to the aisle in the supermarket where there’ll be wooden spoons and potholders and that sort of thing. Unfortunately, this may also be the hard answer, because if you don’t happen to be in Peru, it may be hard to get to your basic everyday market in Peru. Beth at The Spinning Loft in Michigan makes every effort to have them on hand, but what that means is either she has to go there and buy a bunch, or she has to a) have a pal in Peru b) who she can talk into going to the market for her and c) buying up all the spindles he or she can find and d) getting them to her in the USA. Since neither of these things is entirely trivial, when she has them, they tend to sell out fast. Lord knows anytime I’m in Peru, I buy a few. I mean, you can never really have too many, can you? I also tend to pick up wooden spoons, because, you know, same thing. Anyway, these aren’t fancy spindles — they’re plain, utilitarian objects. And you need to have lots, especially if you’re in the habit of teaching people to spin or teaching techniques that are really for this type of spindle. This is all the more true because when you compare these spindles to the ones we’re able to buy in the USA from all of our wonderful spindlecrafters, well, let’s face it, these Peruvian ones are pretty basic. They’re not made from fancy wood; they’re just whatever’s around, which in Peru, usually means eucalyptus unless you’re in the jungle. The whorls are simple lathe-turned chunks, generally undecorated unless they’ve been ornamented with a woodburning tool by the lathe person, or drawn on with a marker. The shafts are sticks that are more or less straight, peeled, whittled straighter, with a slight widening under where the whorl will sit, pointy at the bottom. There’s none of this business with making or finding or putting in fancy hooks, or turning the shaft prettily, or making fancy grooves and notches and whatnot. Nope. 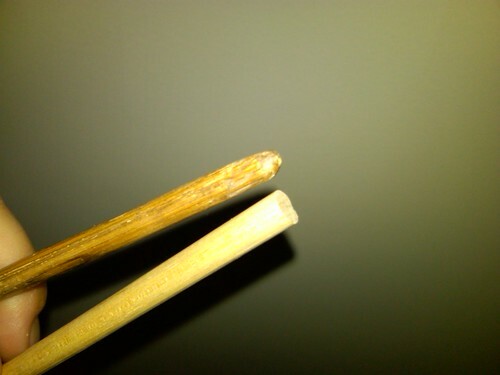 You get the whittled end of a stick. It’s usually pointy when you get it, too. With time, it wears down. Or you can grind it on a rock if it’s too pointy. And the shafts can be splintery. Indeed, I had pricked my fingers this way so many times before I ever actually read about Sleeping Beauty, that when I first heard people musing about what part of the wheel she might have used for pricking her finger, I was flabbergasted. I mean, to me it was obvious: the story says she pricked her finger on a spindle, and seriously, everyone knows that happens all the time. A wheel? Seriously? You’re kidding, right? I mean the story isn’t that newfangled, and besides, it says “spindle” right in it. That said, I don’t think I ever have pricked my finger on a fancy post-industrial style spindle. I mean, there’s sandpaper. And machined dowels. And people who spend time turning shafts by hand. But that’s not what these are. 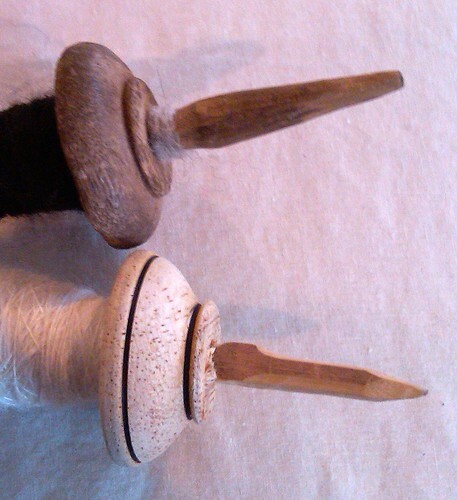 At right, a newer spindle that I picked up about 3 months ago, and have barely had a chance to put any yarn on yet. At left, a well-used, well-worn-in spindle that belonged to Nilda Callañaupa for a couple of years before we swapped spindles in 2008. It’s well-used, but not absurdly so. Nobody in the developed world really makes spindles like this. I think it’s a combination of factors: first, some spinners are hesitant to go with hookless, notchless forms — they can’t believe it’ll really work well without a yarn anchor, or with the yarn slightly off center, and in some cases for some spinners that’s true. It’s also true that unless you know the techniques that go with this kind of spindle, it may seem complicated. So in that respect, there’s kind of a chicken and egg problem: what has to come first? I think people knowing the techniques, and thus creating the demand, probably has to, so that’s where I come in. The second factor, and probably the trickier one, is that I think these are boring for spindle makers to create. It’s just a weight and a stick. There’s nothing fancy to do. I’ve talked to people about making them, and they almost always really, really want to do something more to them — an ornamented shaft, something snazzy with the tip, a particular form factor for the bottom of the shaft, specific whorl geometry, I dunno. I’m forever hearing “Really? Just a kinda centerweighted whorl, and really just a stick? I can’t put a notch on there? You don’t want a hook? What about a knob? I mean you must want something on there. Right?” First I thought it was disbelief… but I’ve since concluded boredom must also be a factor. There’s just not a lot there with which to showcase one’s artistry as a woodworker. And you sorta need to be able to do that if it’s going to be a product you want to sell at a price-point that makes it worth making them for sale. Even if it isn’t boring to make, if you’re constantly hearing “I’m not paying $20 for that! It’s just a basic stick with a weight on it!” it wouldn’t be topping your list of things to make. So my solution is to make my own, putting forth a little more effort than just going to the market, but not by all that much really. 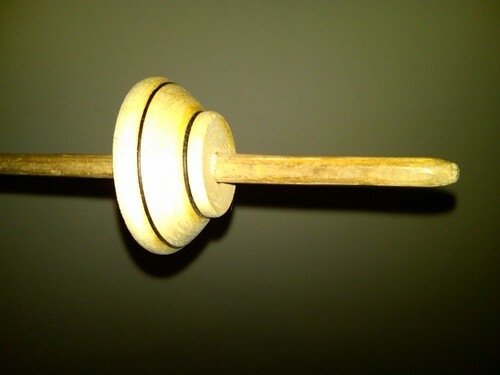 I find pre-cut wooden dowels, and machine-milled wooden wheels for toys. I order them by the buttload from my local dowel mill, but you can usually find them at the craft store or big box megamart. If you can’t, there are a zillion and one online sources — just google “wooden toy wheel” and “12 inch dowel” and you’re all set. The main trick is to make sure you get toy wheels which have a hole in the middle that’s the same size as the dowels you can find. 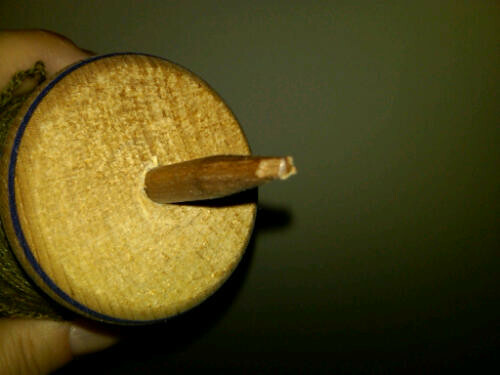 Or dowels that are the same size as the hole in your toy wheels. As to that, I like toy wheels that are 2″ or more in diameter, and dowels that are a quarter inch. Thicker than that and they’re clunky, thinner than that and they’re fragile and you can’t find toy wheels with the right size hole. On the left, a totally unused Peruvian market spindle; on the right, one of my toy wheel deals, also totally unused. Ornamented with a Sharpie, the bottom of the shaft having been sharpened with a pencil sharpener. The tips. Both will be nicer with some use on them. Here’s what happens to that pencil-sharpener-sharpened shaft after a year or two of regular use. I like to sharpen the bottoms because then there’s less drag when you use ’em semi-supported or resting on something a bit, and because you can stick the point in the ground when you go to wind off, the same way they do it in Peru a lot of the time. 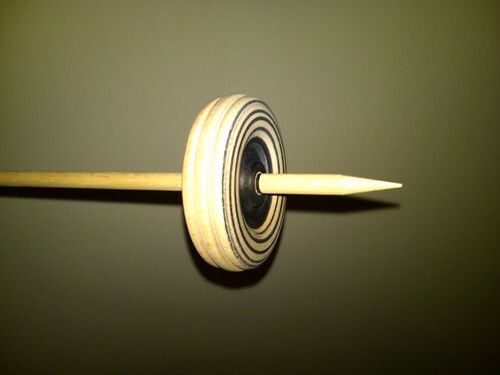 These spindles are cheap, durable, easy to make, and not a lot can go wrong with them. They’re great for what I think of as high-risk spinning activities: going for a walk on concrete, packing in an airline carryon bag, going places where I might lose them or break them. And they’re basically the same thing as the Peruvian ones — inexpensive, easy to find tools that aren’t too dear. This entry was posted in Other Stuff by Abby Franquemont. Bookmark the permalink. Abby, I love your anti-consumerist stance! that’s what they were made for and they seem a perfect match. dropped it while learning I was very thankful for it’s durabilit. I found this post very interesting! Currently I’m learning to spin on some very crude hand spindles and while I haven’t actually pricked myself I have jabbed myself a few times! When doing some research I found that the Navajo Spindle is quite the same. I did not have access to toy wheels( I live out in the Poodunk middle of nowhere) So the closest place was a local hardware store which carries wheel barrow wheels. I put mine together with 2 feet of 3/8 dowel, electricians tape to secure the wheel on the dowel and of course the wheel. My wheel is just below the half way point. I understand that for most people the wheel barrow wheel might be a bit heavy but I have M.S.and the weight seems perfect. Yep I did use the crayon end of a pencil sharpener, however I did sand it and I used an Oak dowel a bit more expensive than the normal dowel but worth it on the wear and tear. I got the hang of it very quickly only about 2 yards of nasty stuff. Now I had never spun before this but saw Master Weaver Clara Sherman’s video on the net, using a Navajo spindle. The Navajo spindle is almost identical to the Peruvian spindle, I can’t really see a difference except the Navajo spindle is a little more modern in view of the fact that sheep and wool were not native to the North American land mass, but introduced by Cortez…. Sorry for the ramble….